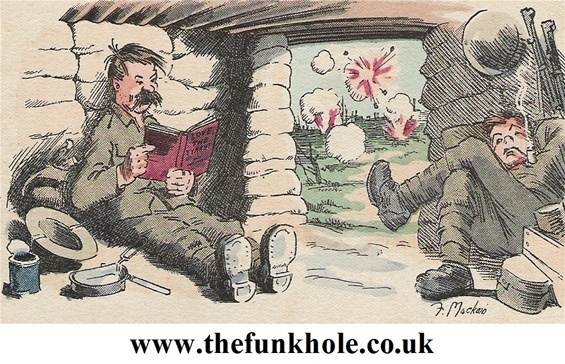 Welcome to The Funk Hole, a source of reproduction paperwork for sale that primarily relates to the Great War of 1914-18. My name is Andrew Upton, here you can read a little about myself, what services I offer, and how to get in touch to discuss what I can do for you. Latest news - as 2015 moves onward I have been busy as usual, beavering away on new projects. This includes an addition to my WW1 Officer's paperwork grouping, Army Form W. 3241F (otherwise known as the Officer's Advance Book for Pay), a 1918 Certificate of Employment During The War, a 1917 Scheduled Occupation Certificate, as well as a copy of the Buckingham Palace headed letter with facsimile signature of George V that would have accompanied the Memorial Scrolls. Please be sure to check out the latest additions. I have been a Great War re-enactor since 2002, and have been replicating items of paperwork for living history purposes since 2005. This was originally for my own personal use, a good example being my replica of the 1918 pattern AB439 Officer's Record of Services after I was "commissioned" into the Vickers Machine Gunners Society 1914-45. At that time there was nobody who supplied any copy of this key item of kit, and so armed with an original borrowed from a friend, a keen eye for detail and a strong desire to do the best possible job I could resulted (after many hours of work) in what I believe to be the first all-new production of this particular book since the end of the war. The results drew praise and interest from similar parties when seen, and inspired me to try to do more of the same but on a wider scale. And so The Funk Hole was born. I enjoy a challenge when it comes to recreating long obsolete items of paperwork, so if you can't see what you're looking for and can provide an original to work from I can usually work something out! To get in touch with me, simply send me an email using the address on the Contact page, and I'll make sure to get back to you. This website is currently under construction, so please be sure to check back regularly to see what appears.